2nd Annual Dale Goodman Memorial Tournament! Joplin is hosting a tournament on May 10 and 11. The Norman Senior Games TT Tournament is coming soon! It will be held on Saturday, May 19, 2019. Entries Close on Friday, May 10! Don’t wait! TOURNAMENT RESULTS OKCTT Players Abdullah Alnashi, Keon and Seif Azadi, Mike Patel, and Linda Piatt all brought home at least one trophy! Monday, April 22 – A Strong League!!! Group “A”: Maria Tran played well! Group “B”: George Banu was mean! Group “C”: Norman Behymer was tough! Group “D”: Joe Tran was on fire! Group “E”: Kathleen Fitzgerald was too strong! Note 1: Due to excellent league numbers, league matches are best 2 games of 3 (to 11). Note 2: Please call or text if running late or even cutting it close. We really need to know who all is playing BEFORE 7:00. 5 minutes till is ok, but cutting it close… 10 till works better. Thanks everyone! 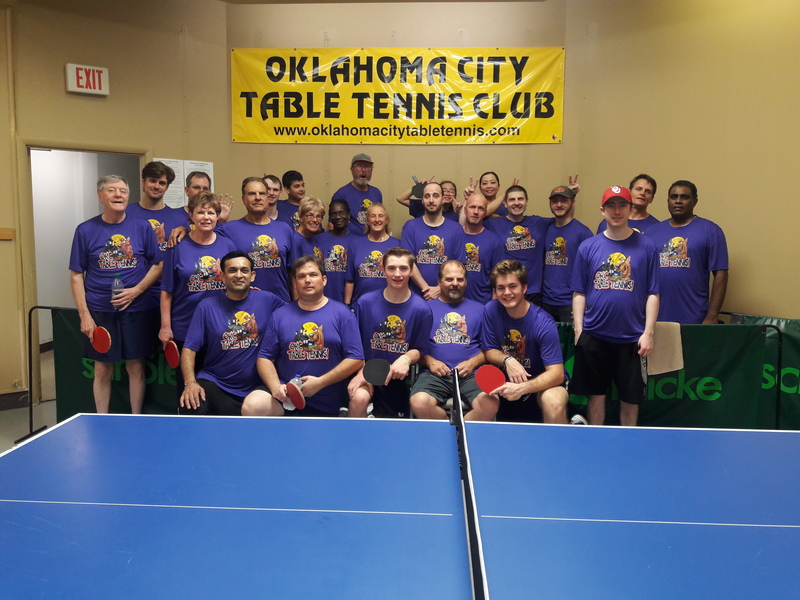 OKCTT hosted the Winter State Game of Oklahoma Table Tennis tournament on Saturday, January 26, 2019. We had a great turnout with players from Texas, Arkansas, Kansas, Missouri, and even New Mexico! We also had an impressive herd come down from Broken Arrow and Tulsa! Thanks Everyone! The morning was dedicated to random draw “Dale Doubles”, which always results in some interesting partnerships. For the second consecutive year, Cam Franks got lucky (again!) and pulled a very strong partner. This year it was Logan Watson, and the two lefties won it all. Cam played very well, but they still had some competition! Their Semifinal match with Dalton and David went 5 games and their finals match was pretty tough as well. Our Board Election concluded on Saturday, 2 June. Below is our new Board! Be sure and congratulate (or commiserate with) the new Board members! Due to higher rent and much higher utilities (roughly double what we were paying at Plaza Mayor), we will have to raise our entry fees starting April 1. We will not be changing the monthly fees at this time, but daily fees will go up $1. The Kid’s fee will apply to players under 18 years old. Monday, May 7 – A Big, Strong League! Group “A”: Logan Watson was too strong! Group “B”: Damion Swearingen was on fire! Group “C”: Lemuel Franks played well! Group “D”: Benjamin Phan was tough! Group “E”: Jay Hayhurst had the answers! Winter Games Went Pretty Well! Thanks to everyone who took the time to come play in our Winter State Games tournament! We had a fabulous group of player! We had players from Kansas, Missouri, Arkansas, Texas, and even Oklahoma! I hope to put a write up on our tournament page, but, till then, here is a link to the results. Thanks again, and we’ll try to make everything better next time! We are excited to announce that we are officially open at our new location!!! The new place is off NW 50th just east of MacArthur. The place was originally a grocery store. It has plenty of room, and should work out well once we get everything sorted. We’ll have ample room for 10 tables – with each court being big enough for doubles! We had to do a LOT of work to get our new place ready to go. Below is a Link to a post the details a good bit of it. Thanks to all the awesome folks who worked so hard to help make this happen! Plaza Mayor management decided to close down the mall. October 31 was our last day playing there. Our new home will be at 5845 NW 50th which is just east of MacArthur on the north side of 50th. The new place is not ready for play yet – we expect to start playing in December. We need to remove old bumpy linolium floor tiles, smooth out the floor, likely paint the floor, and get the lighting sorted out. We will need help with our renovation project! I was not impressed with the turnout for our packing party and was very disappointed with the lack of support for our move. I expected much better. We need a lot more folks to step up and help. The same few people can’t continue to do everything – at least not if the club is to continue. Our club is a non-profit organization. Nobody gets paid anything for what they do at the club – not the President, Vice-President, any other Board Member, or anyone else. Our working schedule at 50Mac (Nickname for new place) it To Be Determined (TBD), but it is very like we’ll be working next Saturday. Details on work schedule will be posted here and (hopefully) on our Facebook page. The more help we get, the quicker we’ll be done and the sooner we’ll be playing again! On Saturday, October 21, 2017 The Oklahoma City Table Tennis Club hosted the second annual Dale Goodman Memorial Tournament. The tournament went very well. Random Draw “Dale Doubles” was in the morning and Handicap “Treachery” Singles was in the afternoon. Doug Marks and Cam Franks won the Random Draw Doubles. Mike Patel and Maria Tran took 2nd. Maria Tran won the Handicap Singles. Brian Stephens played very well and took 2nd. Thanks to everyone who played! I hope everyone had a good time! Oklahoma Senior Games was held on Saturday, Oct 7! We had a good turnout, and everyone seemed to have a good time and got plenty of Table Tennis! Our Road Warrior award for this tournament goes to Rusty Carter, who came up from Austin, TX! The Daily Oklahoman did a very nice article on the OKC TT Club. The Summer Games were held on Saturday, June 24. We had a decent turnout and were lucky to have some strong players come in from surrounding states and from the Tulsa area. Thanks to everyone who came to play, watch, or otherwise support! A brief write-up will be coming and, if I can figure out how to do it, some pictures will be added… See Tournament Page for details. Payment Changes Starting Feb 2017! Starting in February our fee schedule will change LINK TO SCHEDULE CHANGE FLYER. * note: yearly memberships will be from Jan 1 to Jan 1 only – we will pro-rate the 2017 fee since option starts in Feb. 2017 Annual memberships will be $465 for Feb thru Dec. Also annual memberships will be non-refundable – no adjustments will be made should someone decide not to (or otherwise end up being ) unable to play. 2017 Winter State Games Is History! The 2017 Winter State Game was held on Feb 11, 2017 at the OKCTT Club. A more complete write up coming – on the Tournament Page. OKCTT hosted the 2016 Senior Games on October 1, 2016. First Annual Dale Goodman Memorial Tournament! September 17, 2016 The Oklahoma City Table Tennis Club hosted the first annual Dale Goodman Memorial Tournament. It was a blast!!! We still miss Dale very much and a Dale Goodman Memorial Tournament was way overdue. Summer State Games are Finished! The Summer State Games of Oklahoma were held on Saturday, June 18. Results are available on the Omnipong Site LINK TO RESULTS and also on the USATT Rating Site LINK TO RATINGS. We had a fairly small turnout, but overall a very good tournament. Thanks to everyone who played, watched, or helped! Omnipong torunament software was used for the first time. Overall I liked it a lot – once I get smarter and fine tune my match scheduling and organization I think it will be great. A couple folks got delayed more than I wanted – sorry!!! Even with that, we finished almost an hour ahead of my (very conservative) schedule. We would like to hear how folks liked the new format, i.e. sending out whole Round Robin Brackets rather than calling each match individually. I hope it reduces distractions – both the constant match calling and the excessive traffic through some courts. Details are on our 2016 Summer Games Page. 2016 Winter Games are Over! Membership fee structure has been changed. Not surprisingly, they went up. Adult one-year “General Memberships” will cost $75 per year (one year memberships were previously $49/year). The good news (for many) is that tournament ratings fees ($7 to $10(ish?) per tournament) will be eliminated. This means that anyone entering four tournaments per year is getting off cheaper (three per year is about a wash). Tournament ratings fees will be eliminated (yeah!). Tournament Passes will no longer be limited to one-time usage only. Tournament passes will cost $20 ($25 for Nationals and Open) and they are unlimited. The old tournament passes were $10, but there was a $7 rating fee as well, so the cost has effectively gone up $3/tournament. We’ve had a nice influx of new and newer players lately. To help them all get started out, we are offering Table Tennis Basics group lessons on Saturdays. These lessons are free with club entry. We generally spend about an hour going over the basic grip(s) and strokes – plus a little extra when we have time. We are seriously considering adding a more advanced group lesson as well. We have a bunch of advanced beginners, intermediates, and even really good players who need some help. We try to start the beginner group group between 12:45pm and 1:15 pm. If you are interested, please try to get to the club by 12:30 or 12:45. We usually also offer intermediate and more advanced group lessons after the beginner lesson – starting around 3:00. Interested players should arrive early enough to get loosened and warmed up prior to the lesson. Note that we reserve the right to limit the participants in the later lesson. If players can’t do the required strokes, they will not get much out of the lesson and could hold back the more advanced players. We can (and generally try to) tailor the earlier lessons to help these players advance into the later lesson. The Equipment Section has been updated – check it out! While we are talking about equipment, this is a reminder that the OKCTT Club is a Paddle Palace and Cole’s TT distributor. We sell their equipment at their advertised price. If you need equipment or accessories, please check with the club. The club makes a little money on each sale – and we need the money! Also, when you buy from the club, we will go out of our way to help with any equipment problems. If you buy elsewhere, don’t be too surprised if your problems do not become our top priorities. We’ll be open the same hours as before – Monday, Tuesday, and Friday from 6:00pm to 9:00pm and Saturday from noon to 4:00pm. We charge $7 for adult entry and $5 for students and those 18 years old or younger. We also have monthly memberships available for $45/adults and $35/U-18. We have 10 tables set up for normal play. I’m trying to get a big group of players from the Tulsa Club to go. So far we have quite a few interested, seasoned and beginners. I’ll try and keep up to date on the blog to see when the new entry form is on here and will print and hand them out. Let us know when the new form is done. Come see us! Everyone is welcome – we are generally there a bit later than advertised on Saturday. Sometimes we close at 4:00pm, but many times we run till 4:30pm or even 5:00pm. What’s the address? Just moved to OKC! Britt- thanks for your time brother! I met a number of genuinely nice people and saw some great play! !This tournament should be used to promote the club! I can help! I handle marketing/promotions for Wells Fargo Advisors Waterford Branch- The Vance Auto Group- Louie’s (all 23 locations)- we can have a ton of fun and do a lot of fantastic things for charity! My son, Graham Colton ( http://www.grahamcolton.com) just received ‘Best Song Writer’ by The Gazette and is playing the bracket party at 7:00pm on September 13th which is one week prior to official play on September 20 at The Belle Isle Brewery. Channel 4/43 is our TV media partner. I will deliver new posters next week. Lunch on me when easy for you! It was nice meeting you, and we are getting excited about your upcoming tournament. I’ll be putting a notice and link up on our front page ASAP. Just moved to okc from NY and i love to play ping pong. Just looking for a place to smack the ball around alittle. Well come on out and see us! We always like new folk! do you have paddles to borrow when they arrive to play or have to buy some before hand??? Just moved to OKC with my job and was looking to join a table tennis club. I play fairly good and would love to meet new people and play. Sorry to hear that you had trouble. Come back and see us during our operating hours! Our operating hours and directions to the club are on the home page of this site. Both are in the “Oklahoma City Table Tennis Club – Basic Info” box near the top on the right side. They are repeated near the bottom of the home page as well. Is this group and org still up and running strong? Something I’m definitely interested in let me know thanks! Looking to promote an event for players 50 and older at the Yukon Senior Games in April 2016. Please advise any way you can help get the word out. We will offer Singles, Doubles and Mixed Doubles. A few club players have played in the past. John Gillette, Kathleen Fitzgerald just to name a few. Tim – Sorry for the late response. We can definitely help you out a bit. Please send me more information. We can put a notice on this site, talk it up at the club, and even put out some flyers. How do we know if there is a tournament scheduled for Saturday? We are interested in coming this Saturday, June 4th, but only for open play. The Patriarch in Edmond is holding its 4th annual benefit Table Tennis Tournament on July 21st.